The starter is very simple indeed, being a stock Ford part with three mounting ears. In a Focus vehicle I understand it is mounted on the upper rear right side of the engine (the TwinCam block has a transmission bolt point there, but the Zetec block has unused space). I chose to mount it low exactly as in a stock TwinCam. I did have to have the bell housing modified a bit to provide places to bolt the starter to. 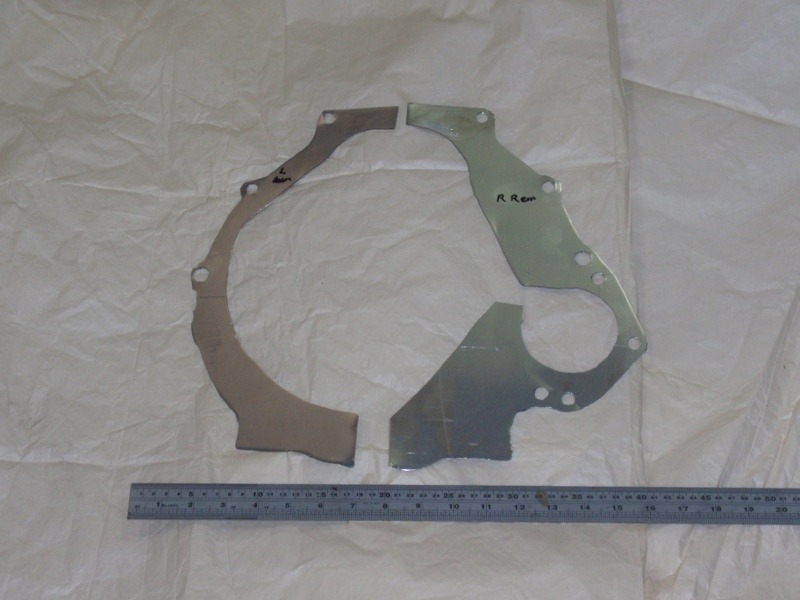 The bell housing was not heat treated so the aluminum alloy is soft. I do not make the starter bolts very tight, I rely on safety wire thru holes in the ends of the bolts preventing the bolts from backing out. The spacers on the two visible starter bolts are there as the bolts have a long unthreaded portion which would not work well in the bell housing threads! There is no 'spacer' for the starter, it bolts directly to the bell housing. Note, though, that the bell housing did require a small change. I am doing my best to remember exactly what I did here... I used some paper stock and cut it out to match the contour of the starter and its mounting holes. Making a paper template. Then I mounted the bell housing and tried to mount the starter and it interfered with the bell housing (of course it did). I drew (on the bell housing) marks for material to cut away. I made my best estimate of where the paper template would mount and marked the template so it was clear how it went on the bell housing. Thus the paper template showed the location of the two new bolts. 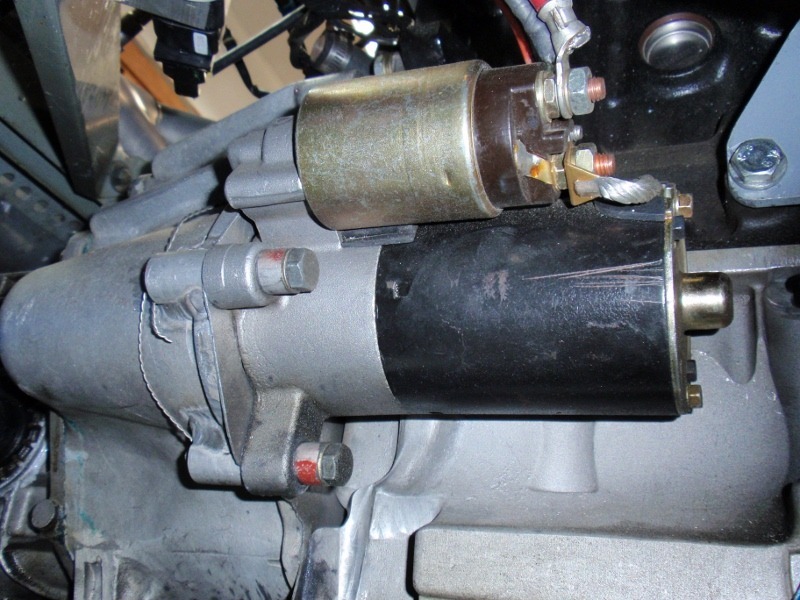 (the top starter mount is the stock TwinCam top starter mount). A welder cut away the metal in the way and welded in place some aluminum to clear the starter and a couple of 5/8 inch bars an inch long or so (threaded 3/8 inch coarse just like the stock bell housing). A bit of low-tech filing made the resulting surface of the welded buts close enough to flat. On first trial mount of the starter it interfered with the ring gear so I filed the 2 lower ears a little (filed the bolt holes). There is a lot of meat there on the starter and it is easy to file. It was easiest to see the starter engagement by looking in the starter-hole that Lotus built into the bell housing. There are some gaps in various places, so one wants some sort of plate to keep rocks and dirt out of the bell housing. My initial dust shields (small pieces fitted here and there) just did not seem very good. So I made these two pieces (one large piece was more than my scrap aluminum on hand could handle). First I made these of stiff paper and then aluminum alloy (not too well made). The fit of the starter was just not right. So I used masking tape and paper to figure out the right starter mount contours and then remade the shield of 0.025 aluminum. To actually fit it, I cut the heads off of a couple of 3 inch 10mm bolts and lightly screw the bolts into the block. This not only holds the dust shield in place (in concert with the transmission dowels on the ears at the bottom of the engine block) but makes getting the transmission on straight much easier. Obviously once the transmission is on the engine I remove the headless bolts and screw in the proper bolts to hold the bell housing on firmly. A small (and unimportant in this setup) portion of the Raceline wet sump had to be machined away to fit the starter there.